The kitchen is the hub of the home, where families join together to cook, study and eat. But too often, homeowners struggle with how to best utilize the space and make their kitchen feel like a welcoming space. The most common reason is due to a lack of space, but simple organization devices can make it possible to get the most from your kitchen area. 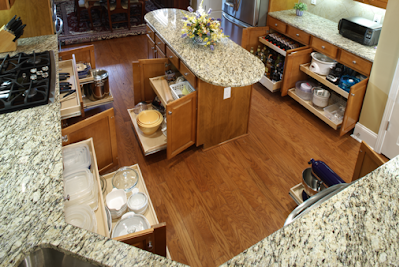 One of the biggest issues with kitchen space is that often gadgets, lids and other containers can get lost and cluttered with daily use. By purchasing pull-out organizational devices, you can keep these items grouped together; make the most of this addition by labeling each. Trashcans are not only unsightly; they often leave abundant odors wafting around the kitchen. When you’re trying to gather your family for dinner or even enjoy a cup of coffee, these scents can completely disrupt the mood. Installing sliding trash and recycle systems can keep recycling and trash out of sight, while making it easier to mask smells. Underutilized wall space is the biggest mistake seen in kitchens. 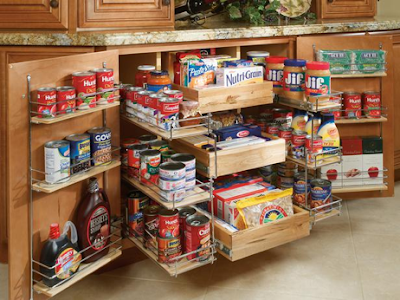 Install shelving units near the busiest areas of your kitchen, to free up storage space and keep items used the most close.